I'm not a classically trained doctor. The initials MD after my name actually stand for Mystery Diagnosis. It's a TV show I watch where medical conundrums are revealed and resolved symptom-by-symptom. It feels a lot like going on rounds with your attending, as you hear patients' medical histories unfold. I know what rounds are like, because in addition to my 10 years of Mystery Diagnosis, I'm also training with world-famous surgeons on Grey's Anatomy - another medical TV show. There are eleven seasons of Grey's that I'm speed-watching to try to finish before the next class of residents take their boards. When I think of all the hours spent in surgery and the time away from my family, I can sometimes resent my calling. But - oh the rewards when bumps bulge and rashes rage, and I am the first to diagnose my officemate's ganglion cyst. I was home with a stomach bug, watching Grey's Anatomy. I had to fast forward through any mention of food, but had no trouble removing spleens, finding blood clots and re-sectioning colons. After a full day of surgery, I was unable to fall asleep and checked out my niece's Instagram. She had posted a photo of what looked like mesenteric ischemia with massive abdominal adhesions where the bowel stickily grew onto itself. I wondered, "Why would my niece be posting pictures of mesenteric ischemia on her Instagram?" 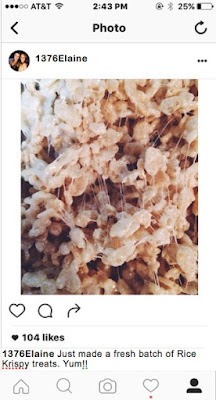 I found my glasses and read her caption "Just made a fresh batch of Rice Krispy treats. Yum!!" My stomach churned. I had to look away.